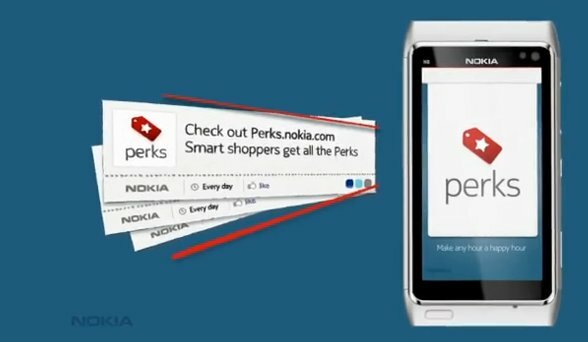 A video showing off a service called Nokia Perks has been leaked to the internet through Vimeo. The video in question has been removed from Vimeo and other video service but some managed to get a screenshot and a description of the Nokia Perks..
â€œIf you like saving Money, youâ€™ll love Perks. Perks are paperless coupons that you can find and redeem right on your mobile. Perks will show you brilliant offers on everything from jeans to sushi. Itâ€™ll even show you how to get there, with the Map View. Now thatâ€™s smart shopping. Hereâ€™s how an ordinary shopping day, is better with Perks. You check your closet andâ€¦ yeah those trainers are just looking to be replaced. Go to Perks.Nokia.com and look in the fashion category, or do a keyword search. When you find a deal click save, and add to my offers, and youâ€™re done. Itâ€™s already saved to your mobile, no printing, just go. When youâ€™re ready to pay, get out your mobile, click the redeem button and show the code to the Clark. And presto, savings! But the day isnâ€™t over yet. A friend texts you asking you to book a table somewhere. Perks shows you the nearby restaurants with offers on them. With some of these, you book the table, right from your phone. When you get there, just say your name as usual, and itâ€™s â€œright this way!â€ Easy booking, friends happy, money saved! This looks to be one of the many ways Nokia plans to refill their pockets with cash. Coupled with things like NFC payments on future Nokia handsets and Nokia maps (Navteq) I see this as a smart move by Nokia. If you are letting customers find the store and make payments with your device, why not let consumers find the necessary coupons as well. I wonder what else Stephen Elop and Nokia have up their sleeves. Written by: Hyde13 on July 9, 2011.